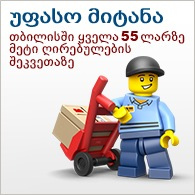 Includes 5 LEGO® DUPLO® figures: 2 adults and 3 children. 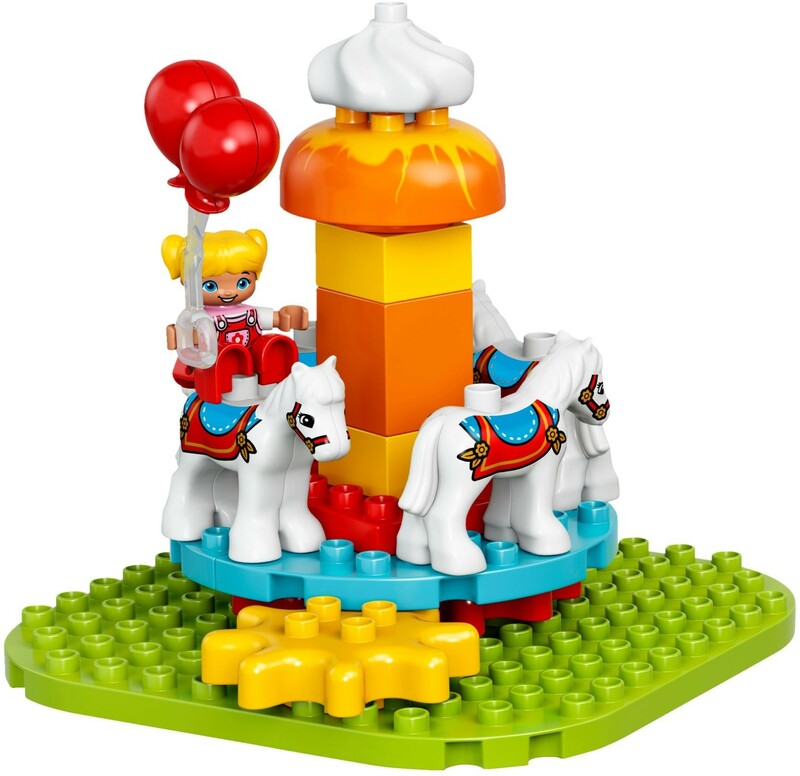 Features a Ferris wheel with 3 cars and turning function, rotating carousel with 4 horse figures and gearwheel function, stand with 2 wavy slides, train with carriage, ice cream kiosk with table and chairs, and a restroom block with toilet and sink. Includes bricks decorated as ice creams, orange juice, measuring chart, toilet paper and soap bottles. Accessory elements include a camera, balloons, whipped cream and a cup. Help your child use the turning functions to spin the Ferris wheel and carousel. 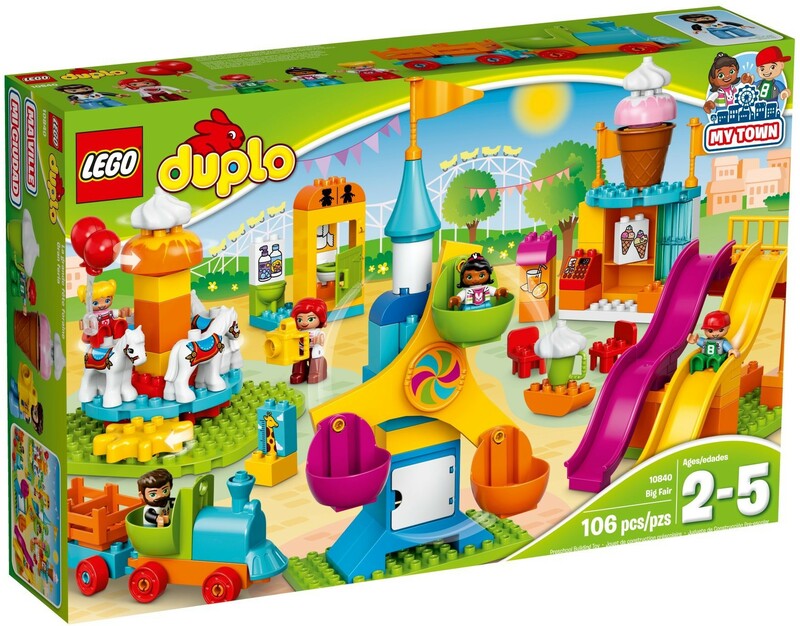 Toddlers will enjoy sliding the LEGO® DUPLO® figures down the wavy slide or pushing them along in the train. 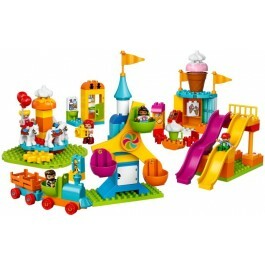 Use the modern characters, accessories and decorated bricks to play out family fun in a fun fair environment. Ferris wheel measures over 14” (38cm) high, 7” (19cm) wide and 6” (16cm) deep. Carousel measures over 7” (20cm) high, 7” (21cm) wide and 8” (19cm) deep. Ice cream kiosk measures over 9” (24cm) high, 4” (12cm) wide and 3” (7cm) deep. Train measures over 3” (9cm) high, 9” (24cm) long and 3” (6cm) wide. Combine with the 10839 Shooting Gallery to extend the fair environment. 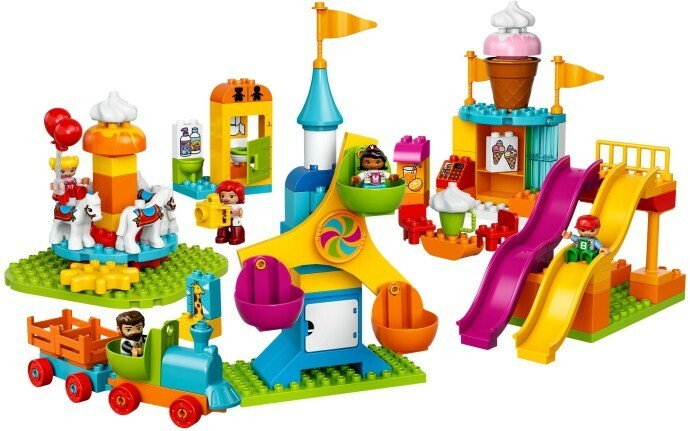 There are several My Town products to collect and play out family fun in a recognizable LEGO® DUPLO® world.